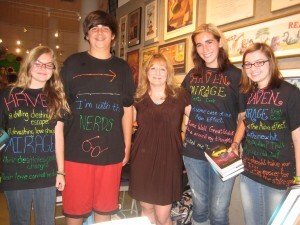 In my last post, I mentioned that the fabulous YA author Kristi Cook invited me as a special guest to her launch party at Books of Wonder in NYC for her thrilling HAVEN sequel, MIRAGE. I have to admit, I was really honored to be there alongside her at such a great venue for her book launch. Thanks, Kristi! As with all of Books of Wonder‘s terrific events, the party was a spectacular success! We both read from our books and graphic designer, Corey Godwell, talked about the very cool original art that he created for Winterhaven. After a fun Q&A, we did a raffle with some fab prizes and then signed books & posters for attendees. On top of a bunch of super-supportive bloggers and friends, (Wanda from Good Choice Reading, Cindy from Books Complete Me, Nikki from Wicked Awesome Books, and Rachel & Megan from Read. Write. Ramble. ), Haven & Mirage fans showed up in unique “Winterhaven Warriors” t-shirts designed with quotes from Kristi’s books! 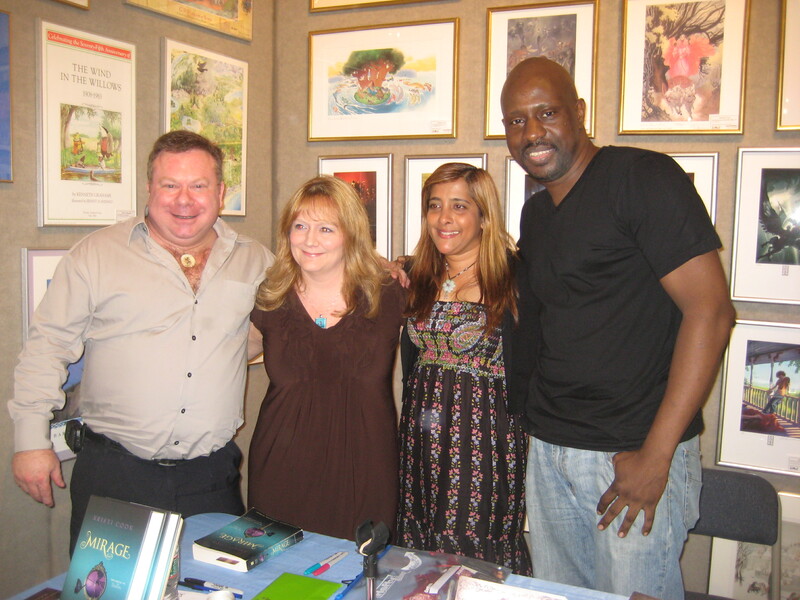 It was a really fun book launch! If you didn’t have a chance to get to Books of Wonder last night for Kristi’s launch party, you can still enter my HAVEN & MIRAGE GIVEAWAY for your chance to win your very own autographed copy of both of these exciting books! MIRAGE picks up right where HAVEN left off and does not disappoint. Fans of the series will love this installment, and new readers will be hooked! 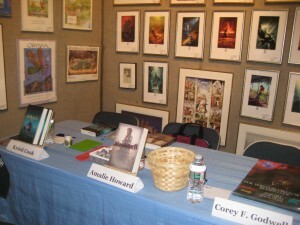 You can also purchase signed copies of HAVEN, MIRAGE & BLOODSPELL from Books of Wonder directly. They ship worldwide. For the full launch party photo album, check out the BLOODSPELL Facebook Fan Page. And please do like us if you haven’t already, to stay on top of upcoming events, photos, reviews and giveaways.